Rhea Saturn's Moon - Solar System Planets And Moons Section. Saturn's Moon Rhea. Image credit: NASA/JPL/SSI. This Cassini image of Saturn's Moon Rhea shows a bright, white spot in its leading hemisphere. This bright feature could have come from a large impact, and has been examined by Cassini several times from different angles. Cassini took the photo on June 25, 2005 when it was approximately 1.1 million km (700,000 miles) away from the moon. This view of Saturn's Moon Rhea shows the tremendous bright splat that coats much of the moon's leading hemisphere. 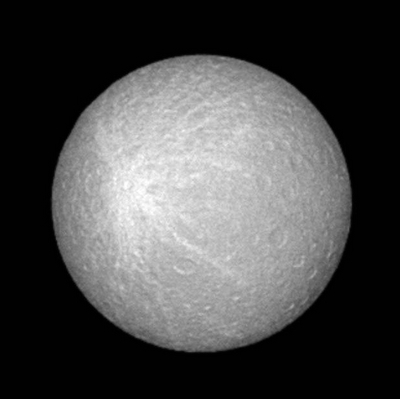 The bright feature may be impact-related and is visible in other Cassini images of Rhea (see http://saturn.jpl.nasa.gov/multimedia/images/image-details.cfm?imageID=1594). Rhea is 1,528 kilometers (949 miles) across.